Computers are made of different components or parts, collectively known as PC hardware. 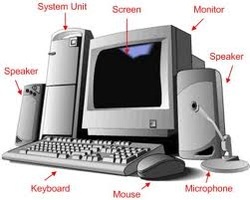 Some of the main hardware PC units include CPU, mouse, screen monitor, hard disk, keyboard, CD drive, etc. * CPU – This part is the brain of the computer. It is known as Central Processing Unit and works as a processor. The most popular processors are manufactured by Intel popular as the Pentium Chip model. Intel processors are popular all over the world by most of the computer manufacturing companies. * Mouse – This hardware is essential for desktop models as navigational object, to click varied options, selecting different objects and accessing necessary information on the computer screen. There’s two main buttons within the mouse, to be used to access info. Nowadays, you can find interesting types of mouse in the market such as laser mouse or ball mouse. But, they all serve the same purpose to assist access computerised info from the CPU. * Hard disk – This can be a device that helps in storing data. The all-round performance associated with a computer actually depends on the rate of their hard disk. Higher rotational speed of the hard disk enables fast and high speed performance by that particular computer. * RAM – It is also known as Random access memory, which helps with storing of temporary information in the CPU. When You turn off the computer, such temporary info files are erased. The optimum performance of the computer also depends on the size of their RAM. * Keyboard – This is one of the most important part in computer hardware. Keyboard helps users to enter specific commands by punching of alphabets, numbers or signs. There are other function keys like Control, Alter, delete, F keys, Page up, Page down, etc in the keyboard. There are a total of 101 keys in almost any standard keyboard, and designed in such a manner in order to make typing faster and simpler. More complex computer hardware includes scanner, joystick, external drive, printer and servers. Buying individual computer hardware parts can be a tedious task as there are variety of selection models, styles and designs to choose from. It is best to gather some basic top notch info about the specific computer hardware part that you intend to buy.